Xeon CPU/Processors. Core 2 CPU/Processors. Dual Core CPU/Processors. Point of Sale. Generic Picture Used. Bare CPU/Processor only. Apple & Mac. Cables Connectors. No exception. B : Moderate scratches, worn off or tiny dings can be found. fyi(Most of general used parts belong to this grade). B : Mostly looks clean but you may notice visible scratches or minor wear on certain area(spot) fyi:(Most of computer components like CPU, RAM or motherboard belong to this grade). Part number:SR00H. checkout before your order will be cancelled. The order cannot be combined or modified after checkout has been completed. Puerto Rico or Virgin Islands. "Sold AS PICTURED". Part Number: SR00H. PART NUMBER: SR00H. TRANSFER RATE: 5 GT/S DMI. THERMAL DESIGN POWER: 80W. SMART CACHE: 8MB. CPU FREQUENCY: 3.2GHZ. CPU MAX TURBO FREQUENCY: 3.6GHZ. COOLING DEVICE: NOT INCLUDED - PROCESSOR ONLY. Product Details. Product TypeComputer Central Processing Units. Original box not included. Processor Number E3-1230V2. Processor Base Frequency 3.30 GHz. Status End of Life. Instruction Set 64-bit. Instruction Set Extensions SSE4.1/4.2, AVX. # of Cores 4. Launch Date Q2'12. Part number: SR00H. The order cannot be combined or modified after checkout has been completed. checkout before your order will be cancelled. Puerto Rico or Virgin Islands. Socket Type: LGA 1155. Interface Type: LGA 1155. CPU Frequency: 3.2 GHz. Main Frequency: 3.2GHz. 1 Stick For Samsung 4GB PC2-6400 DDR2 800Mhz 240pin High Density Desktop AMD RAM. For ASUS ZenPad 10 Z301ML P028 Black LCD Touch Sceen Digitizer Assembly. Included is single SR00H Xeon E3-1230. Xeon E3-1230. Clock Speed. Max Turbo Speed. The CPU Mall. AMD FM2 904 pin CPU. AMD 938 pin CPU. AMD 940 pin CPU. AMD FX-4300 3.8GHz Quad-Core (FD4300WMHKBOX) Processor. Help & Info. National tariff issue. Item Specifics. Notes on sSpec SR0P4. Socket type Socket 1155 (LGA1155). 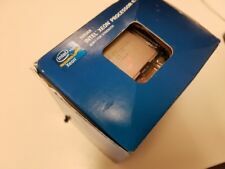 Processor number E3-1230 v2. Type CPU / Microprocessor. Processor core Ivy Bridge-H2. Core stepping E1. Case temperature (°C) 65.8. 1 x Thermal Grease. Product details MPN: CM8066201921713. Prozessor-Taktfrequenz 3,4 GHz. Prozessor Boost-Taktung 3,8 GHz. Brillante Remoteanwendungen. RAM-Speicher maximal 65536 MB. Bus Typ DMI3. Prozessor Besonderheiten. Cache 8 MB SmartCache. Processor Number E3-1240. Processor Base Frequency 3.30 GHz. Status End of Life. Instruction Set 64-bit. Instruction Set Extensions SSE4.1/4.2, AVX. Launch Date Q2'11. Advanced Technologies. Compatible Slots 1 x processor - LGA1155 Socket. Processor Model Xeon E3-1230. Processor Quantity 1. Product Type Processor. Expansion / Connectivity. Product Identifiers. MPN CM8062307262610. Multi-Core Technology Quad-Core. MPN CM8062307262610 SR00H. Type of Part CPU (Central Processing Unit). Quantity 1. CPU Frequency: 3.2 GHz. We would like to take care of you better than anyone else no matter what the conditions! You have no risk. Main Frequency: 3.2GHz. Socket Type: LGA 1155. Interface Type: LGA 1155. CPU Frequency: 3.2 GHz. Main Frequency: 3.2GHz. 64-Bit Support: Yes. Ruturn Policy. Power: 80 W.
The CPU Mall. Help & Info. National tariff issue. Cooling Component Included : None/Processor only. EAN : No aplicable. Item Specifics. ◈ LGA 1151. We usually. The CPU Mall. Help & Info. National tariff issue. Cooling Component Included : None/Processor only. EAN : No aplicable. Item Specifics. We usually. CPU Frequency: 3.2 GHz. 5.5" Touch Screen Digitizer Glass LCD Display Assembly For Elephone S7. Model Number: E3-1230. For Samsung Tab Pro 10.1" T520 White LCD Screen Touch Digitizer Assembly. For NANYA 32GB 8x4GB 2Rx4 PC2-5300F DDR2-667MHz 240pin ECC FB-DIMM Server RAM.